Ready for More Beechwood Harbor? Holly’s Back! 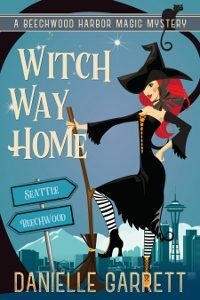 Book Four in the Beechwood Harbor Magic Mysteries Series will be available next week! I’ll have a special, first week sale price to say “thank you!” for waiting so patiently. In the meantime, here is an exclusive sneak peek at chapter one. It was strange how much a place could change and yet look exactly the same. The last time I’d stepped foot inside the Seattle have, the secret community hidden somewhere between the human and supernatural world, it was the place I called home. Now, standing on the main street that wound through the heart of the city, I felt like a complete stranger. During my year of banishment I’d grown detached from my old life inside the busy city. Magic pulsed through the haven, an undercurrent of all the powerful forces and beings that walked the glittering streets. In the past that swirl of power would have excited me but instead it felt overwhelming and confusing. Then again, the reason for my trek to my former home wasn’t exactly cause for celebration. In less than twenty-four hours I’d be standing before the powerful Haven Council, waiting to see if I would ever be allowed to practice potion magic again. My lawyer was confident but his assurance hadn’t quite yet rubbed off on me. I mostly felt like I’d just stepped off a merry-go-round that had been spinning at a hundred miles an hour. However, I was determined to ignore the urge to hurl long enough to have lunch with one of my longtime friends—and paranormal party-planning extraordinaire—Anastasia Winters. So after stopping off at my city central hotel long enough to drop off Boots and get him settled with a bowl of cat kibble, I headed out to meet Anastasia at one of the haven’s best cafe’s, Finnegan’s. Their claim to fame was the hearty soups they prepared and served in miniature cauldrons. Old world style. All the charm; none of the barbaric treatment. Not to mention that the cherry cider was the best thing to ever come out of a barrel. Walking the streets of the haven was a surreal experience. All of the shops and restaurants I used to frequent were bustling with witches and wizards, shifters, were-creatures, and goblins. I even spotted a majestic looking centaur striding down the street. The farther I walked, the more comfortable I became. The anxiety ebbed and I actually started to smile as I drank it all in. The sights, the sounds, the smells. Beechwood Harbor was populated with supernaturals. I was hardly alone. But there was something about being immersed in it. The freedom of not having to hide. I could let my witch-flag fly high and proud. I could send up a shower of pink and gold sparks that would rain down as glittering butterflies and no one would bat an eye. Still smiling, I turned the corner and veered away from the main street through the haven’s mercantile district. Finnegan’s was the anchor, centered in a small cluster of shops. Wedged between a handcrafted potion shop that I used to frequent and a bookstore that sold enchanted books that read aloud as the pages were flipped. I had quite a collection of them as they proved to be very handy tools while doing potion work that required getting a little messy. Which, for some reason, seemed to be most of the ones I made. I stopped short when I rounded the corner. The potions shop was gone. The windows boarded up and dark. I moved closer but didn’t see any signs that the building was for sale or lease. I cupped my hands and peered inside the dirty caked windows. The shop appeared dank and grimy, as though no one had been there in quite some time. My heart sank at the sight of what the once-charming and vibrant shop had been reduced to. I also wondered what had happened to Mrs. Clairmont, the owner of the shop. A widow of nearly a decade who’d always kept the shop stocked with carefully crafted homemade potions. She’d run the place single-handedly but never hesitated to stop and answer my questions when I was first learning the process to make custom potions. I hadn’t thought about her in quite some time but suddenly missed her as I stared inside the abandoned shop. I whirled around at Anastasia’s voice and saw the pretty brunette running delicately in her impossibly high stiletto boots. I liked nice shoes as much as the next witch, but I honestly had no idea how Anastasia made it through the day without breaking both of her ankles. She leapt up onto the sidewalk and grabbed me in a tight embrace. “I can’t believe you’re here!” she said into my long auburn hair as it whipped through the wind. She laughed, the sound melodic like a tinkling wind chime. When she pulled away, she kept her hands on my arms. We’d spoken on the phone many times since my banishment and met for lunch a couple of times in Seattle proper, but the visits had been few and far between. Seattle was over three hours away from Beechwood Harbor so visits usually involved a long train ride and a hotel room for the night. Anastasia had officially moved inside the haven following her big promotion at work and my banishment prevented me from staying on her pull out couch. At first I’d tried to use my Larkspur necklace but found—after several uncomfortable attempts—that it only allowed me to jump short distances. I frowned at her sudden change of topic but let her steer me through Finnegan’s doors. The owner, Walter Finnegan, greeted us warmly and for a moment, I forgot all about the shop next door. We were promptly seated at a table with a window and without consulting the menu ordered two huge cauldrons of soup. While we waited the owner brought out a still-steaming loaf of bread with a thick crust and we both dug in. “Tell me about work. Still loving it?” I asked, unsure if I should ask about Mrs. Clairmont’s shop again. Anastasia nodded, her mouth full of bread. When was more like if, but I wasn’t going to argue the semantics with her over lunch. Walter brought out two cauldrons of soup and I smiled all the more gratefully at the timely interruption. When he was assured that the soup was to our liking, he bowed out and went back to the kitchen. The small dining room was full of late-lunch patrons and the steam from all the soup made the air thick and warm and filled with the scent of flour and seasonings. “Why’s that?” Anastasia asked, cocking her head slightly. After stocking up on all manner of sweets and treats at my favorite bakery, Anastasia walked with me back to the stately hotel I’d checked into a few hours before. The three-level building had a brick facade with lush greenery that framed the wide stairs that led to the front doors. I glanced up toward the room I’d checked into a couple of hours earlier. The room was sandwiched on the second floor and had a view of the street. I smiled when I spotted an orange backside pressed up against the glass. Clearly Boots was making the most of the last bit of sunlight breaking through the gray clouds. His blonde hair flapped in the breeze and his usually rosy cheeks were even more colorful in the chill of the late winter afternoon. “Did you just arrive?” he asked when he came to a stop. He waved and then disappeared inside. Anastasia waved her hand and a sleek black car pulled up at the curb. She’d given up having her own car when she moved from Seattle proper into the haven. She was within walking distance to her work and said there was no need to pay the absurd parking fees when there was a plethora of cabs within the haven. As soon as her cab was out of sight, I drew in a sigh and headed up the stairs to the front entrance of the hotel. The afternoon with Anastasia had served as a wonderful distraction from the real purpose behind my visit to the haven, but in her absence, all of my underlying anxiety rushed back like a tidal wave. Right back into the swing of the stories … looking forward to the release. This is worse than having one bite of a Lemon Cloud!!! I am waiting not so very patiently. More excitement in the witching world! Holly is a great character and I can’t wait to see how her story develops. Feels like coming home after a vacation. Famiiar, comfy and exciting. Can’t wait for more.